This recipe for Creamy Deviled Eggs offers a combination of contemporary flavors. These savory bites are an elegant twist to a traditional favorite. With a dash of dill or seasoned with curry, these appetizers make a delicious - and stylish - beginning to celebrations. 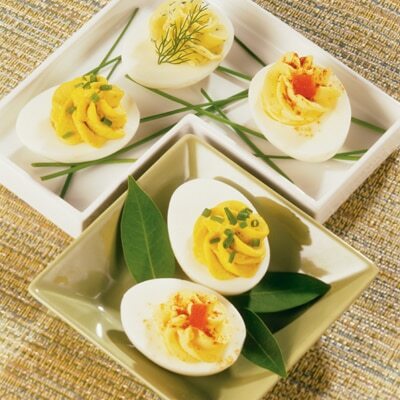 CUT eggs in half lengthwise. Remove yolks and place in medium bowl; mash well with fork or pastry blender. Add evaporated milk, mayonnaise and mustard. Stir until creamy. Season with salt. SPOON or pipe into whites. Sprinkle with paprika. Dill Deviled Eggs, add 1 1/2 teaspoons chopped fresh dill. Eliminate paprika. Curried Deviled Eggs, eliminate Dijon mustard, use 1/3 cup evaporated milk and add 1 1/4 teaspoons curry powder. NOTE: Can also substitute with NESTLÉ CARNATION Evaporated Milk or NESTLÉ CARNATION Evaporated Fat Free Milk.